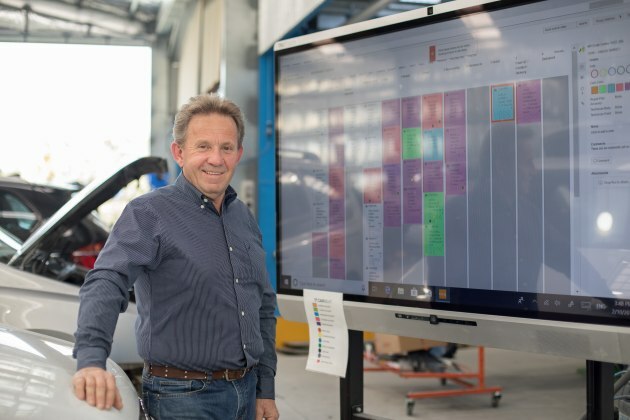 Carbeat, AkzoNobel’s digital process control solution was introduced in Australia in early 2018. Carbeat is an intuitive and practical tool, deployed on a 70-inch touch screen where activities can be moved with a swipe of a finger. Carbeat delivers positive impact through improving transparency of all bodyshop processes. It delivers strong analytics for the owners, who can then identify improvements throughout the entire bodyshop process. Importantly, Carbeat drives positive changes to staff engagement and morale, as this simple tool empowers employees on all levels to fully engage and share responsibilities for the end results. Since Carbeat is cloud based, the updates occur in real time. The columns and colours indicate the status of various jobs. A quick glance at the board can answer any question someone in the shop might have about a particular vehicle. 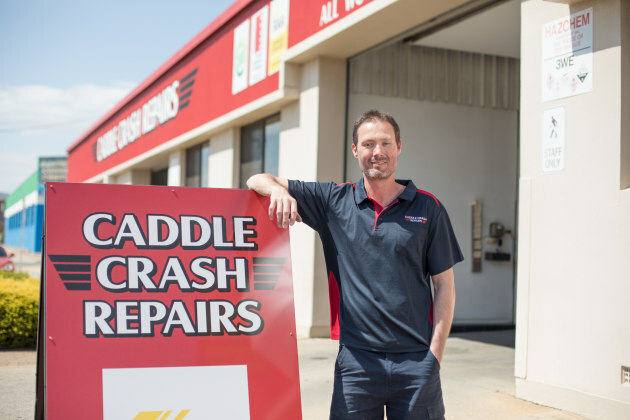 Caddle Crash is one of the largest bodyshops in South Australia employing over 25 staff and handling over 70 vehicles a day. Brenton and Mike Caddle came to a point where could not go on without digitalising their manual processes and streamlining daily operations. They searched for a system that creates accountability and allows all to concentrate on their assigned jobs. Carbeat has many useful features, but one that Brenton and Mick called 'a game changer' is a Repair Planning Diary. It is used daily to book-in work and spread the work load evenly throughout the whole month. It allows the bodyshop to pre-empt what work is coming in, allows checking which days are thin, if the bodyshop is behind, and forecast the weeks ahead. “Carbeat has allowed us to start seeing a real snapshot of what we have sitting in our workshop, identify bottlenecks and alleviate them by shifting our resources accordingly. All staff members are accountable and are able to prioritise and plan their day as a result. Everyone within our business is interacting and we are all able to make accurate estimates that the job is on track. Paul Ray, AkzoNobel Services Consultant worked with Caddle prior to the installation to tailor and setup the production board to suit the shop’s needs. The actual installation process consisted of Paul setting up all hardware, software and initial data input followed up by three full days onsite training of all staff members on how to interact with Carbeat. Carbeat has created an environment where everyone within the Caddle’s business feels they input into the day's results. It has improved communication from front office to the floor of the workshop without actually having to communicate face to face. “Through using Carbeat, the paint shop now operates in a more organised and time-structured manner resulting in an atmosphere of less pressure, with less mistakes. Quality and rework issues that may have arisen have dramatically decreased“, Caddle says. “Overall our culture and morale has seen the biggest change, all the frustration of the manual handling has been removed, everyone knows who is doing what and the process is transparent and simple, there is now a sense of clarity and inclusion. We think anyone who isn’t using Carbeat is crazy,” Caddle says. Mt Pleasant Crash Repairs, also in South Australia, is run by Tom and Lucia Campaniello and has over 30 years’ experience in the collision repair industry. “Prior to Carbeat we would have a daily work schedule meeting and go through what was coming and going. We found that there was a grey area around who was accountable for what and how daily operations should be scheduled. Everyone was unsure as to who was allocated to what," Campaniello said. “We use Carbeat as an essential day to day tool to keep business flowing and it 'lubricates' my workshop. It’s an all-inclusive digital system, which ensures all departments are gelling. The girls in the front office now have a live vision of where the car is in the repair process and don't have to run around the workshop. Customer satisfaction has also increased due to the accurate communication and forecasting of completion date. “Our biggest challenges were controlling parts and sublets and scheduling the tradesmen to the job. Since implementing Carbeat, I now have a better control over workflow. All staff now have a central system which can provide them clarity of what needs to be done which has saved significant amount of time and increase productivity dramatically.” Campaniello added. Carbeat is exclusive to Sikkens customers. For more information contact Paul Ray on: 0458 111 255 or paul.ray@akzonobel.com, or click here.